Johnston Press told staff at its 200 or so newspapers that it was ‘business as usual’ this week, when it announced the company was being put up for sale. The announcement was the latest twist in a dramatic and unstable year for the company, which has so far seen shareholder pressures and in-fighting, followed by the departure of its CEO of seven years. But it’s not just 2018 to blame for the troubles faced by the publishing company; instead, a legacy of mismanagement and poor decision-making laid the foundations for a fragile future. As I come to the final year of my PhD project, which is analysing the impact of digital tools on production, identity and jurisdiction of regional newspaper newsrooms in the UK, I look back on the uncertain past and uncertain future of Johnston Press. 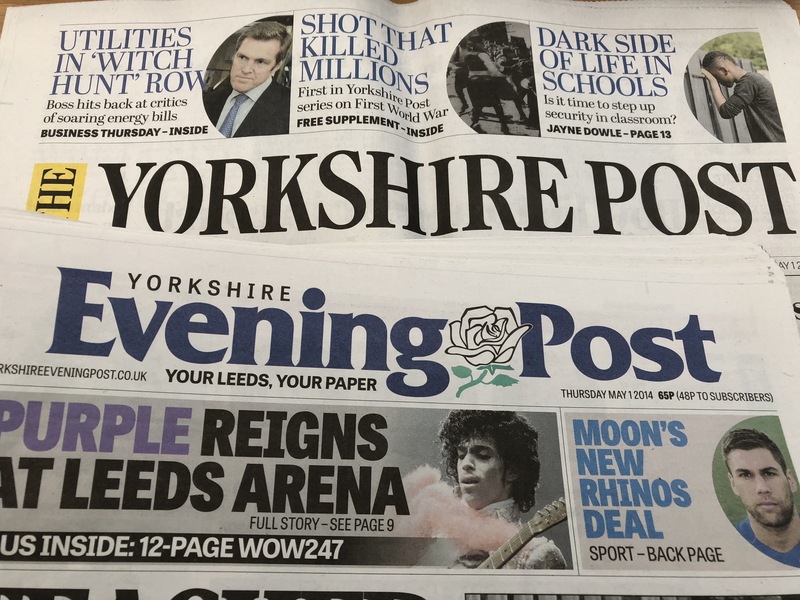 Two of Johnston Press’ top titles are the Yorkshire Post and Yorkshire Evening Post. When Ashley Highfield was appointed CEO of Johnston Press in 2011, he made it his mission to move the local newspaper company firmly into a digital format, while still making print a top priority. At the time of his appointment, a move he made from Microsoft, Highfield told The Herald newspaper that ‘print was not dead’ and that his vision was to move JP into an all-singing-all-dancing print and digital dream. By anyone’s standards, this was going to be a tough job to pull off. Digital was still treated with mistrust by those in the industry and it was clear fewer people were buying newspapers – how could the future be rosy? And they weren’t wrong. Up until that point, the vision and focus of the company in terms of digital had been confusing at best and cak-handed at worst. In the run-up to Highfield’s appointment there had been a rapid succession of top bosses trying desperately to navigate the challenges posed by the internet. This included a series of flash-in-the-pan attempts to make the company succeed in a quickly evolving online environment. There was heavy investment in exceptionally expensive camera and editing equipment for most newspapers, including Sony video cameras, mics, tripods and Avid editing software – and yet no proper training or support was provided to help journalists with the skills they needed to shoot and edit videos. And the infrastructure of newsrooms, the continual loss of staff who weren’t replaced and the hand-to-mouth production of news for a regularly printed product meant there was very little time for individual editors to mobilise staff who had the skills into producing video content. And where was the money in video? The question remained unanswered – because the answer was unknown. In many newsrooms the heavy camera bags gathered dust, the editing equipment went untouched. Twitter started making headlines, but staff were told not to give news away for free on social media. Then, in the space of about a year, newsrooms were told they had to become multimedia and put everything on the website and to promote it all on Facebook. There was very little guidance, policy or training. Journalists felt their way, making mistakes, getting to know the online audience, falling foul of trolls, fake news (usually rumour spread by the online audience), making mistakes and learning from them and stretching resources to the limit in order to run a daily news production unit with the same number of staff who had previously been working on a once-a-week printed title. But where was the money online? How could free online content make money? Especially when it was the same content as included in the printed, paid-for product. In newsrooms, the question went unanswered and the mistrust of digital methods deepened. In the meantime, JP was letting staff go at an alarming rate – not just because of the rise in digital, but because of a debt the company had accrued in 2005 when it purchased a series of titles in Ireland for £96m. The crippling debt was a struggle to pay back and the interest racked up. In JP’s 2011 financial report, produced shortly after Highfield became CEO, it was reported the company had generated an annual revenue of £373.8m – not bad, until the company debt of £351.7m was taken into account. And, of course, there was additional burden due to the ongoing challenge posed by free or cheaper space online and the resulting decline in print advertising. Titles merged or closed, print runs dropped, staffing continued to decline and newspapers became thinner. Circulations melted away. Centralisation of journalists and sub-editors meant staff working on a weekly news title might be producing it from a number of locations, and often without setting foot in the locality being served by the title. Content was shared and local columnists and reports were replaced by more generic features and news, often provided by PA or syndicated news agencies. There was a significant step back from the front line of the communities being served, with offices closed and the buildings sold off or tenancies terminated. Reporters had less time to leave the newsroom and titles turned to more contributed content, including press releases and photographs (many newsrooms had lost their photographic staff and had to rely on reader pictures, freelancers and the occasional staff photographer loaned from a larger sister title in the area). To manage its resources JP trialled its Newsroom of the Future project in 2014. The project, which was rolled out company-wide the following year, saw formal centralisation of news teams and the division of ‘news’ and ‘community content’. Community content was produced by desk or home-based journalists who would work with contributed content like press releases and letters. ‘News’ was produced by another bank of journalists. The project later evolved to mean the jack-of-all trades expectation originally placed upon staff was reduced, with individual journalists taking responsibility again for specific tasks such as social media management, digital and website management and print. During this time, newspaper websites significantly improved, especially for those titles which were still considered to be the best of JP. The daily and larger weekly titles which drew an audience saw heavy investment with their online offering – including a bank of digital staff, social media editors and investment into social media platforms like Facebook in order to offer the audience a better online viewing experience. Online content became king. It drove news agendas, with viewing targets and audience figures becoming as important as print ABCs. Journalists were expected to use algorithms to determine their news agendas and to respond to popular online stories by producing more of the same. And the investment was working; while print sales figures for JP continued to dramatically plummet, the online audience figures continued to rise healthily and steadily. But, still, where was the money? The eternal question of how to make money out of online was one of the key panic points prior to Highfield’s appointment. Was it through video? If so, how? How could online advertising generate the same cash as print? (it can’t). Could content be charged for? In 2010 JP had tried introducing a paywall on the websites of some of its smaller titles. The pilot was a disaster. The sites chosen for the experiment were rarely updated prior to the paywall introduction and their audience figures were low. The paywalls failed and the experiment scrapped. Advertising on stories and video was making some money for the company, particularly as online viewing figures increased. And when the audience was of an enviable standard in terms of size, the company launched a project to sell space on its social media platforms and websites to customers via the JP Local Business Plan. Essentially the project monetised content which would have previously have been used in a news capacity. Press releases were no longer used if they were seen as potential money-makers for the company (the Facebook story below is an example of this in action). The company also rolled out other marketing and business solutions at different sites owned by the company. By the time Ashley Highfield waved goodbye to JP in August 2018, the company was increasing its revenue and profit online via advertising and paid-for content. The story of the demise of Johnston Press is a sad one. It seems a bad decision was made at a spectacularly bad time and the company and its staff and customers have been paying for it ever since. When JP announced it was putting itself up for sale yesterday the loan debt was standing at £220m. JP has some wonderful titles. Titles which campaign, hold power to account, shout out for the underdog, connect audiences and people and which make a difference to local democracy. It has also lost some wonderful titles. And driven others into the ground by removing investment, staff and relevant content. Unsurprisingly those titles have lost their print sales hand over fist. And their online offering is a randomly updated mixed bag of content from larger sister titles, with the occasional locally relevant news story. It is not the fault of the journalists, editors or production staff, who work horribly hard with little reward. Those lesser titles, the smaller ones, the uninvested in, are those at most risk from the JP sale. Who will want to buy a newspaper which is almost at the point of losing money? The established flagship titles, which have enjoyed investment and are heralded as the jewels in the JP crown – the Scotsman, the Yorkshire Post and Yorkshire Evening Post, the Sheffield Star and the i – will be snapped up. It’s the Pontefract and Castleford Express-type newspapers – which are already suffering due to a lack of dedicated staff, no presence in their towns, no investment and shared content – which will be left on the scrapheap. It is sad and worrysome. My prediction, for what’s it’s worth, is that the larger JP titles which have seen investment and done well in steering the tanker round to meet the company’s digital plan, will be sold off. The smaller ones will not. The company will be broken up and significant parts of rural England and Scotland may well find themselves without a local newspaper. The buyer is unlikely to be Reach Plc (formerly Trinity Mirror), which has set up its own digital-only news platforms in some of the cities which already play host to legacy JP print titles (Edinburgh and Leeds). Reach continues to invest heavily in digital, whilst simultaneously pulling back from print publishing and investment – it is unlikley to want a series of print titles. However, Reach may offer to buy the digital-only part of the company in order to continue its roll out of ‘Live’ products, using the already established JP audience. If this happend, it would be interesting to see what the Competition and Markets Authority made of the bid – after all, if Rupert Murdoch is not allowed to monopolise UK national news, should a publishing company be allowed to do the same in regional news? The buyer is unlikely to be Newsquest, the smallest of the ‘big three’ regional publishing companies in the UK. Newsquest still seems to be struggling with its digital master-plan and its titles continue to close. It is an uncertain past, followed by an uncertain future at Johnston Press. When the announcement of the sale was made this week staff were told to carry on and that it was ‘business as usual’. Sadly, following a decade of change and difficulty, this statement isn’t far from the truth. Previous Regional newspaper or local online journalist? Then have your say on what skills and tools are being used in the newsroom today.